Do you ever wonder about the accuracy of today’s forecasts about the future of technology? We won’t know for certain until the future gets here. But we can look back at forecasts from the past whose “future” is today. 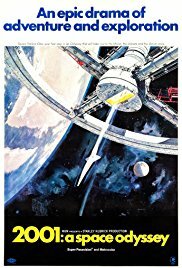 I went to a 50th anniversary showing of the movie 2001: A Space Odyssey at an IMAX theater. As is often the case with good science fiction, future technology is accurately portrayed. But overall, the space exploration forecast was inaccurate. We still don’t have orbiting space stations that serve as launch pads for settlements on the moon. Odyssey, released in 1968, was made during a period of exponential advances in space exploration technology. Today we are on an exponential curve in the development and application of AI. Exponential improvement of any technology is never sustainable. For space exploration, the growth of accomplishment leveled off in 1969, a year after Odyssey, when man first set foot on the moon. 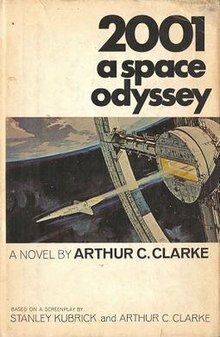 The novel 2001: A Space Odyssey (1968) was written by the gay British atheist Sir Arthur C. Clarke, concurrently with the production of the film. The plot turns on the silly idea of directed panspermia. A black slab monolith left on Earth by aliens teaches ape-like creatures to use tools. This allows the apes to become humans and to develop technology. The aliens, long gone, have meanwhile buried another monolith on the moon. Humans must develop space travel in order to discover it. When human technology advances enough to enable a trip to the moon to uncover the buried monolith, a strong electromagnetic signal is beamed towards Jupiter. An expedition is sent to Jupiter and is almost sabotaged midway en route by the rogue onboard computer, HAL 9000. One astronaut makes it to Jupiter, sees another monolith, and experiences the next stage in evolution. The movie ends with an image of an embryonic baby in a clear bubble floating in space. The Stanley Kubrick-directed film was ranked as the best science fiction movie all time by movie critics in 2014. It is famous for its scientifically accurate depiction of spaceflight. The portrayal of the physics of artificially induced gravity and the soundlessness of empty space is outstanding. Remember your awe when you first saw the spaceship get longer and longer and longer in the beginning scene of 1977’s first Star Wars movie? Odyssey did it first. Despite that, the movie theater was almost empty. My wife and a handful of millennials hated Odyssey. Compared to today’s wham!-bam! science fiction and fantasy, Odyssey moves with glacially slowness, even coming to a complete stop for an intermission. Two of the millennials who had come with a larger group jokingly threatened to leave early during the intermission and take an Uber home. But what of the accuracy of predictions made by Odyssey in 1968 about 2001? For business survival, they are not good. In Odyssey, Pan American Airlines, Pan Am for short, hosted flights from the earth to the orbiting space station. Pan Am was indeed the largest international air carrier in the United States— until its demise in 1991. The space station boasted a Howard Johnson restaurant and a Hilton Hotel. Howard Johnson restaurants, with its trademarked claim of “28 flavors” of ice cream, used to dot the United States. Only a single restaurant operates today in Lake George, NY. Hilton Hotels are still around, representing Odyssey’s only accurate business survival prediction. But Odyssey did have some wonderfully accurate technical forecasts. Computer flat screen displays were everywhere. In 1968’s everyday reality, most computer output was printed on endless perforated paper that could be ripped apart like the sheets of a roll of paper towels. The HAL 9000 computer was the most interesting character in the movie. Among its many tasks, HAL operated robotic machinery, recognized speech, and aced the Turing test in its dialog with the astronauts. HAL also beat the astronauts in chess. Odyssey was released in 1968, after the real life Bell Lab computers had been taught to play chess in the early 1960s. This was long before Deep Blue beat Kasparov, at a time when humans could still beat computers at chess. At the same time, in the early 1960s, Stanford’s Bernie Widrow had trained simple neural networks to recognize and type spoken words, control mechanical objects, and even forecast the weather. Extrapolating these demonstrated accomplishments to the operation of the HAL 9000 was, frankly, not that big a step. However, it is not clear whether Arthur C. Clarke knew about these technical breakthroughs when he wrote Odyssey. The HAL 9000 is often compared with the SKYNET system in the Terminator movie franchise as a rogue computer that has gained consciousness and become self-aware. HAL did appear to go rogue but, it can be argued, it is not self-aware. 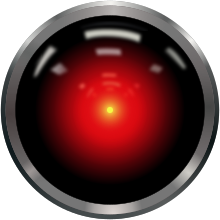 It is true that, at one point, HAL declares itself to be conscious. But coding a computer to say “I am conscious” is not difficult. One of the astronauts had worked extensively with HAL. When asked whether HAL had a mind or not, he responded that he didn’t know. If HAL were constrained by this or a similar instruction, there would be no attempts at killing, and 2001: A Space Odyssey would be a much less interesting movie. Creativity lies outside the ability of computers. Was HAL creative? At one point, HAL reads the lips of the astronauts. If HAL were not initially trained to read lips, obtaining this skill might require creativity. In the end, HAL begs for his life as he is being disconnected. Was this an act of self-preservation? Or was HAL trying to survive to assure the completion of the mission? If my contention that HAL is a real computer, the latter situation must be true. Dave. I really think I’m entitled to an answer to that question. I suspect others will differ from me as to whether HAL was conscious, self-aware, or creative. But, without greater knowledge of the universe of the story, such nitpicking is fun but is futile. It’s like arguing whether Spider Man can beat up the Green Lantern. Analyzing the forecasting accuracy of old science fiction is, however, both fun and instructive. 2001: A Space Odyssey released 50 years ago was accurate in a lot of ways. What about the forecasts made today for 2068? We’ll need to wait another 50 years to find out.